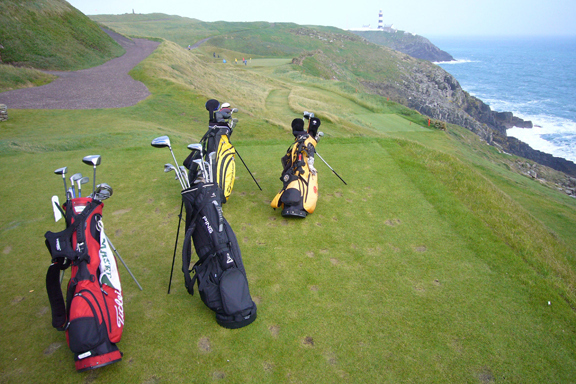 Four walkers, Old Head Golf Links, Kinsale, Ireland, May, 2006. 11. If you walk and play fairly quickly, golf provides real exercise—not aerobic exercise, usually, but a mildly elevated level of metabolic activity. Golf doesn’t ruin your knees the way running and tennis do, and the time you spend playing golf is time you can’t also spend sitting in front of the TV eating coffee ice cream and drinking Yoo-hoo. 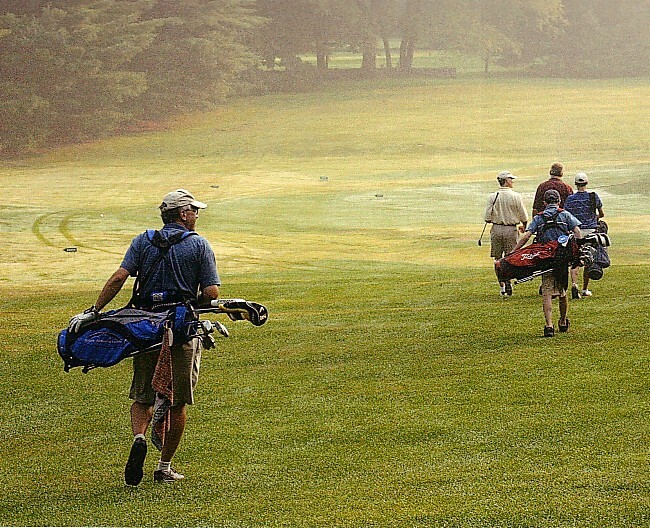 Mark Twain famously dismissed golf as “a good walk spoiled,” but it’s actually a walk improved, since golf, unlike mere walking, gives you something challenging to think about, as well as something interesting to do with your hands. Golf is a walk with a purpose. This entry was posted in 18 Good Things, Golf Courses, Ireland and tagged Kinsale, Mark Twain, Old Head Golf Links by David Owen. Bookmark the permalink. I don’t play golf but I absolutely agree–I run into old ladies like me all the time with tennis elbow (from tennis) bad knees (from running), etc. Me? I’ve been allergicto any organized sport since I was 10. Gym class is the only class I cut in highschool. Swimming and walking is what I’ve done and so help me at 92 I have never had a knee or hip replacement and have no aches and pains from arthritis. Avid exercise (other than walking) is beyond what God wanted us to do with our bodies! Excellent perspective! “A walk improved”. Nice!